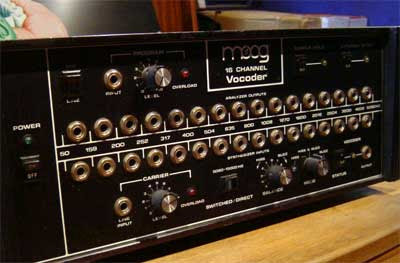 £2,950 gets you eBay item 300219454269 a 1979 Moog vocoder, apparently used by Monty Python on their 'Contractual Obligation' album. The seller promises 'more collectable audio gear from our Monty Python collection'. Somehow, it's not quite as attractive as Kraftwerk's original vocoder, which sold on eBay for $12,500 in 2006. Lousy reception! Farts all over my dicky just when i pull it out. i love synths. buyers! people are ripping you off with this 'warm sound' nonsense, run it through some old tape, use some tricks for the love of god(universe). dsp advanced. Especially the one on the MicroKorg. Lovely find. Props to you for resisting the temptation to say "And now for something completely different." I couldn't. krafterwerk dealio def would've been more choice. not that I can play one lol. Something I've been trying to figure out... Does Imogen Heap use vocoder technology as well? I'm always confused, as when I see her live performances, she seems to run it through software on her pc. Always enjoy your website. Feel free to say hey some time. We're at smartmusicians.blogspot.com.